Afternoon Tea is an integral part of British culture and as such widely appreciated as an activity to spend your Sunday afternoon. The classic experience is usually offered by cafés and 4-star hotels. 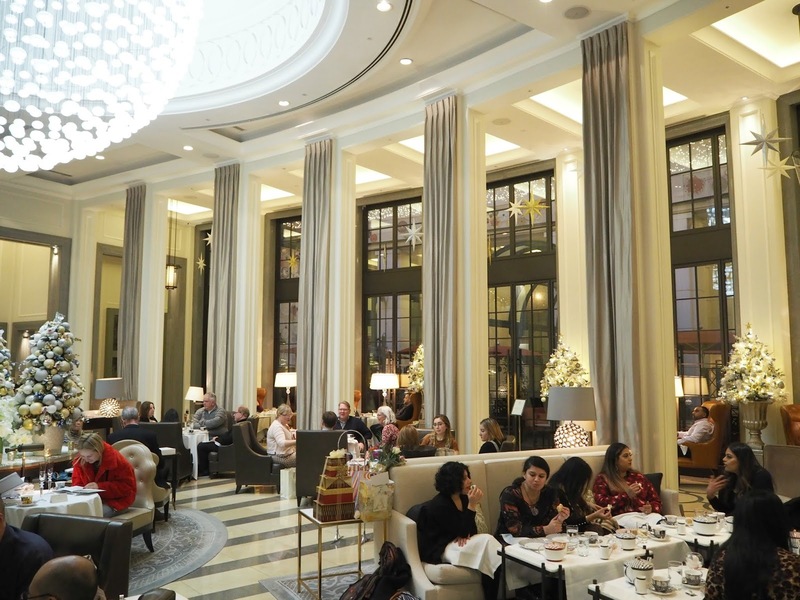 Think Ascot, Sketch or Peggy Porschen as London's top addresses - but even in Central, high-end hotels in Westminster have been very popular for the extravagant tradition. 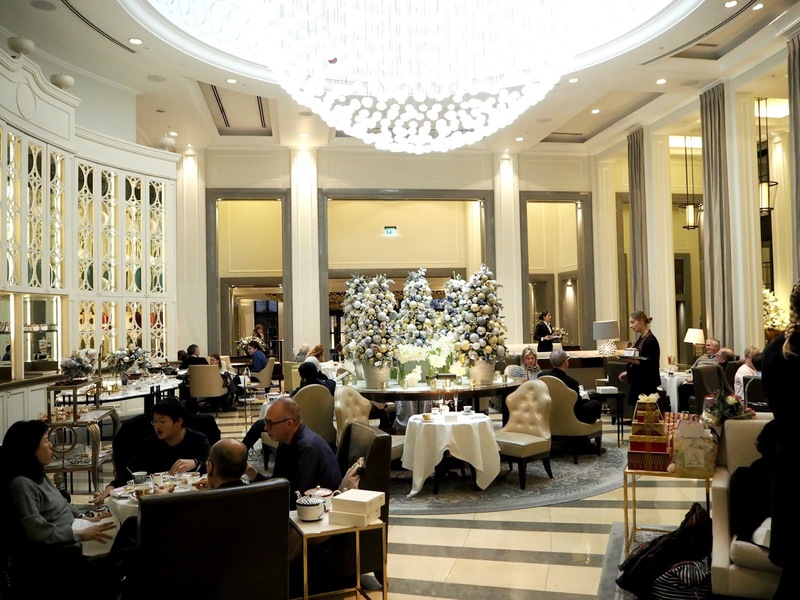 In particular, The Corinthia Hotel is worth mentioning here as it serves Afternoon Tea* in the most traditional British fashion set in the most luxurious surroundings you'll ever see. 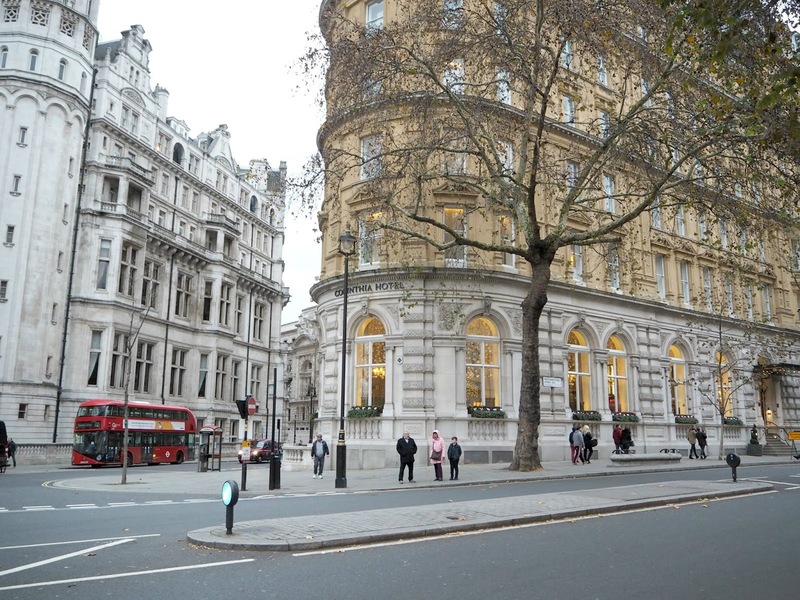 Located in a leafy side street leading up to Trafalgar Square, right next to the Embankment underground station and overlooking the Thames is the 5-star hotel The Corinthia. 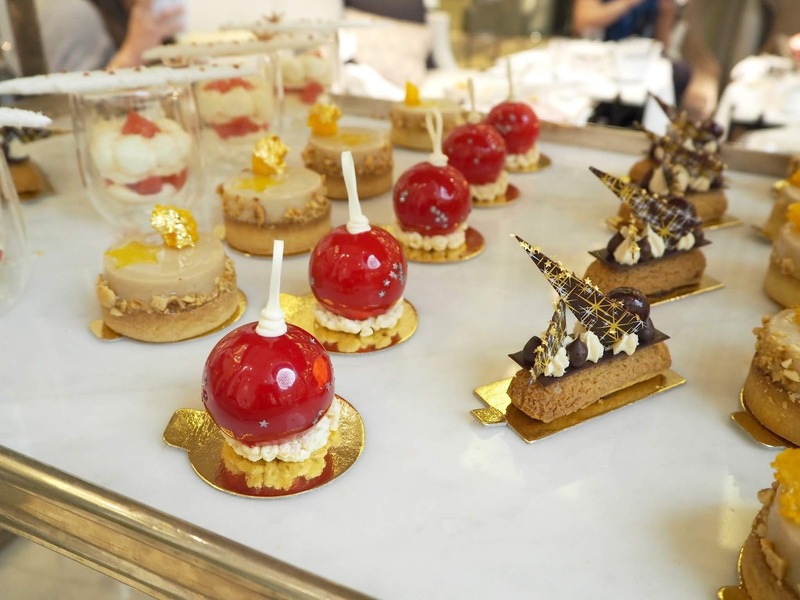 It’s been known for its exquisite penthouses and lavish suites regularly visited by celebrities such as Victoria Beckham, Will.I.Am, Bill Clinton or Beyonce – but The Corinthia will soon also be known as THE place for Afternoon Tea. 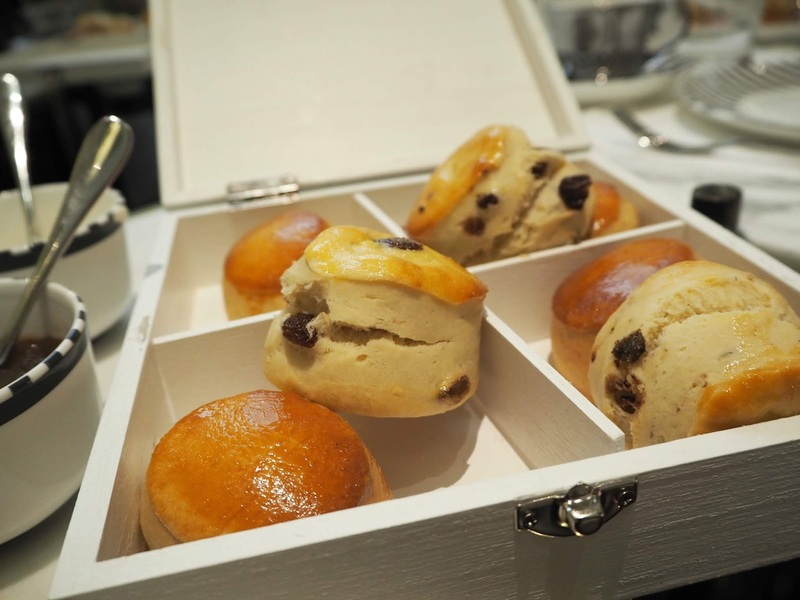 In fact, the hotel has invested in reinventing their previous Afternoon Tea all year and launched their new tasty experience with a contemporary twist in the summer. It’s not as much as the hotel is venturing into new territory as the classic elements of Afternoon Tea are very much incorporated. It is more the combination of taking a new turn on some of the classical elements which shows bravery to bring British longstanding tradition into 2018. The service is discrete and highly professional, yet greets you with a warm welcome upon arrival and further scores with excellent hosting skills throughout your entire stay. 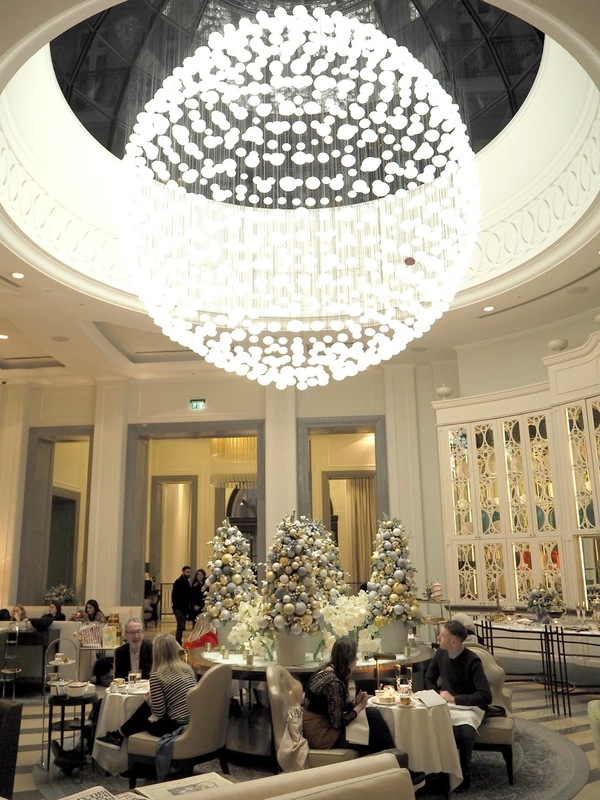 The Corinthia serves Afternoon Tea in their Crystal Moon Lounge which is dominated by a magnificent chandelier as its centrepiece. Under this opulent globe of shiny lights is the marbled lounge with white sofas that are so soft that you sink into the fluffy cushions once sat down. 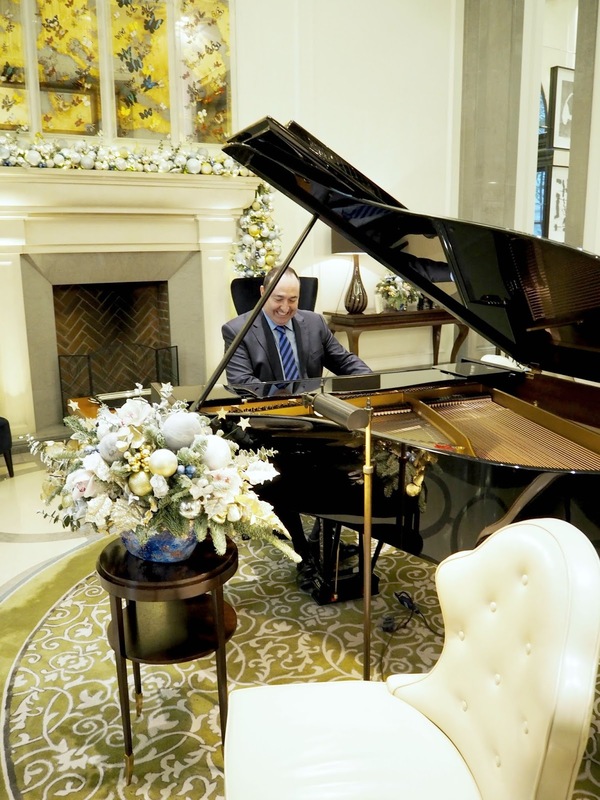 To set the scene further, you’ll hear Kevin Lee playing from the main entrance – the hotel’s pianist and star of the lounge – soon filling the air with the most beautiful Christmas songs. The lounge is open which allows you to be directly in the middle of The Corinthia’s heart and become a part of its high-end luxurious world. And you’ll never know who may walk past as you’ll see some interesting people dressed in suits or extravagant fur coats walking in and out of the hotel. 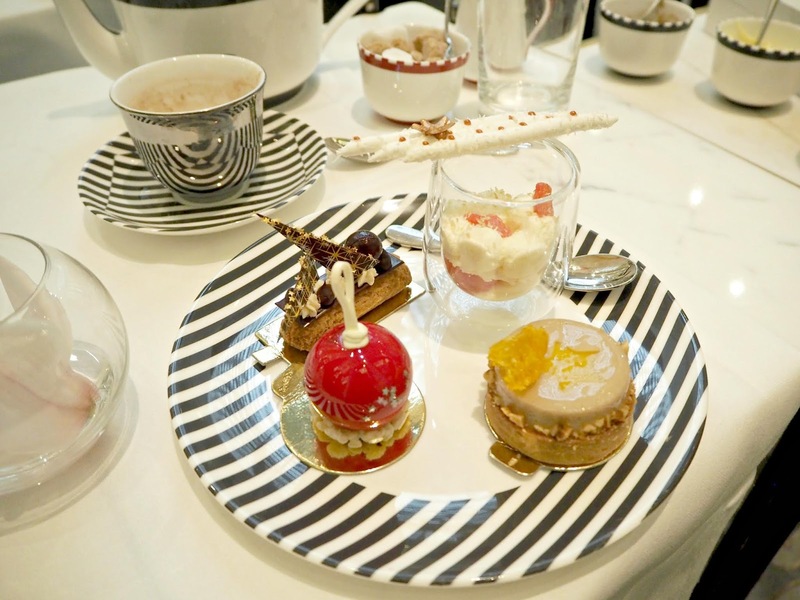 The real head-turner, however, are the tasteful cutlery and bespoke tea sets which The Corinthia has ordered specifically for the new Afternoon Tea experience. 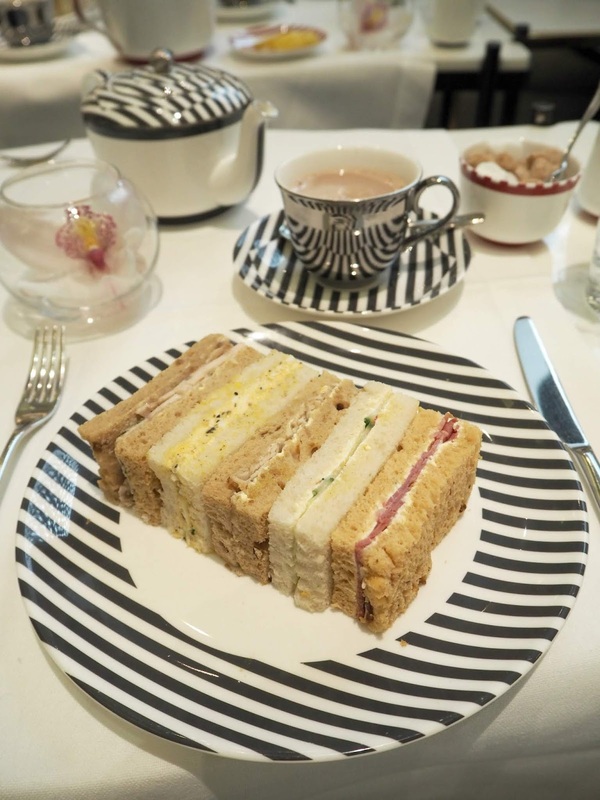 The 25 sets consist of black or red striped teapots and plates plus either a silver or golden shimmering cup which reflect the striped pattern and create a marvellous effect. The delicate porcelain is so elegant and further complemented by crystal Champagne flutes, each set costing around £200. With such a set up there’s only one thing missing: the food. With a selection of more than 26 different teas, the choice is tough. From mango tea via rooibos, green tea to British Earl Grey or even Matcha – each tea is carefully curated and prepared by a tea sommelier. 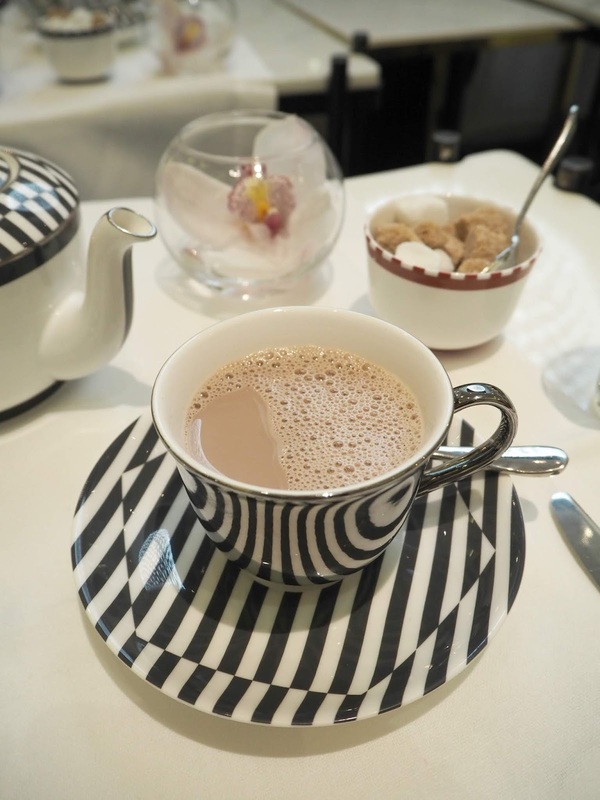 There’s also the option to choose Hot Chocolate which is unconventional but well received by guests. This is a nice twist to the usual Hot Chocolate as this one is made with milk and a dissolved piece of fine Chocolate which applies a tender subtle hint of chocolatey flavour and a more dairy taste to the drink. The selection consists of five delicately placed sandwiches with fillings such as egg & truffle mayonnaise; cucumber, radish & cream cheese; turkey, caramelised apple & chestnut stuffing; horseradish cream with watercress and salt beef or the classic salmon sandwich. My personal favourites were the egg & truffle mayo and the beef with horseradish cream. Both choices were flavoursome with a delicious creamy texture that would leave you wanting more. I had seconds on both of them and I don’t regret it at all. The truffle in the egg & mayo sandwich was full of flavour and very exquisite. The horseradish & beef version was an excellent blend of the two flavours venturing into new culinary territory. Though I find horseradish to be sharp and unpleasant at times, this one was more creamy with a very subtle hint - at first, I actually thought it was cream cheese. Highly recommended. 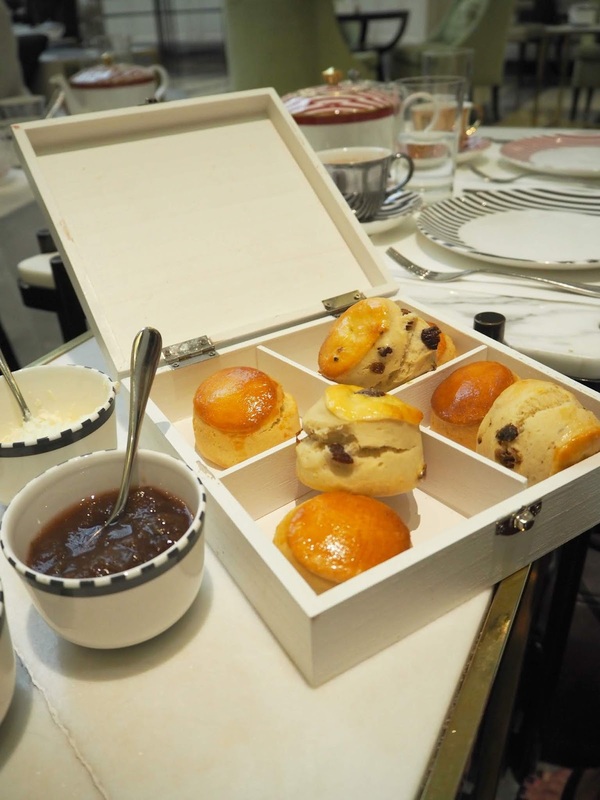 The presentation is everything with the next course: scones, either plain or with raisins are served in a wooden tea box together with strawberry or rhubarb jam and Cornish clotted cream. The amazing display was an Instagrammer's dream! The scones themselves are light and fluffy with a wonderful shiny sweet glaze on top. In combination with the rhubarb jam and clotted cream, this divine treat takes the Afternoon Tea experience to the next level. After tasty sandwiches and sweet scones, the final course is an epic highlight. 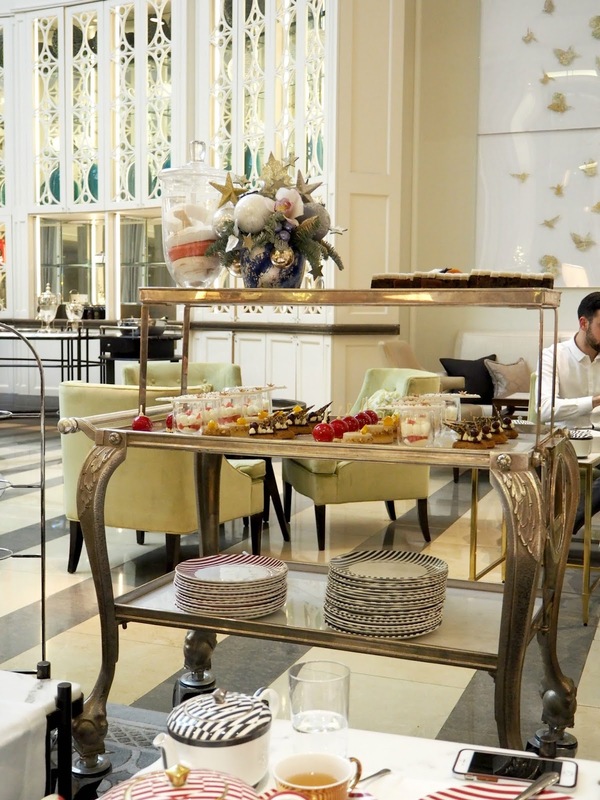 The hotel breaks with the tradition of having a delicate cake stand to present the cakes and patisserie, but a Victorian silver trolley displays all the festive delights instead. Each piece is designed of the highest quality with absolute impeccable precision that these could have easily come straight out of a French patisserie – in fact, there’s a French man involved. Chef Loic Carbonnet has created beautiful compositions such as chestnut, mandarin & hazelnut tartlets, mini black forest cherry eclairs, white chocolate & cranberry snow baubles, traditional Christmas loaf (aka Stollen), rum vanilla chocolate truffles and a ruby grapefruit with mascarpone Chantilly & coconut meringue. The stars of the trolley, however, are the snow baubles with their meticulous shiny glaze. 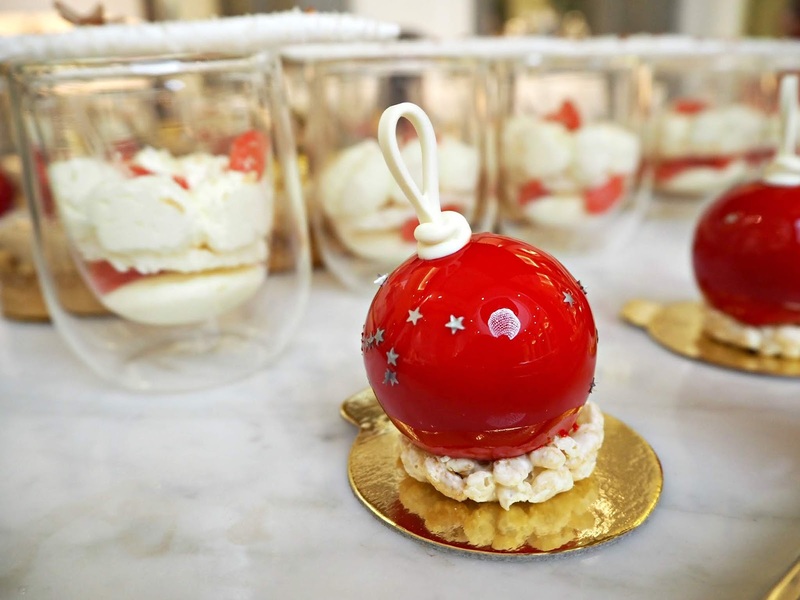 These little baubles are a pure joy to look at and the inside doesn’t disappoint either: made out of vanilla and white chocolate mousse there’s a delicious fruity cranberry core embedded on a crunchy crisped rice base. The glaze has a hint of cranberry flavour but is never too sweet, too sticky or overpowering. 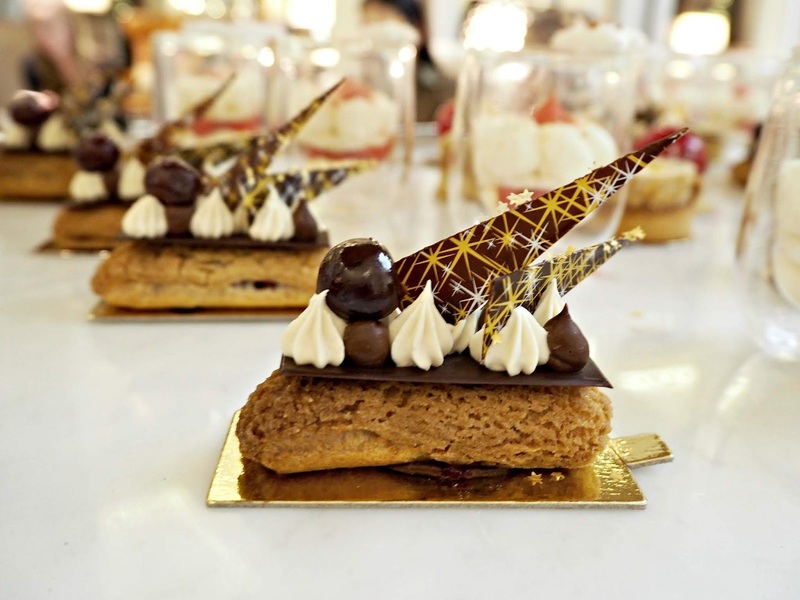 Unlike the Black Forest cherry éclair which has a rich cherry filling and a very boozy cherry on top. The combination of the dark chocolate paired with the taste of cherry will never get boring plus it’s a nice reminder of my German culture. Though visually stunning the hazelnut tartlets and the grapefruit Chantilly were a bit mediocre for my likening. The tartlets have an interesting texture, somewhere between nutty and gritty with a rather dull taste. The mandarin livens up the combination but is too weak to make the tartlet a culinary standout. Unlike the grapefruit in the mascarpone Chantilly with its sharp and bitter flavours make a disturbing contrast to the sweet and otherwise creamy mascarpone and coconut meringue. Overall though, the Chantilly is a cute dessert and a safe crowd pleaser. 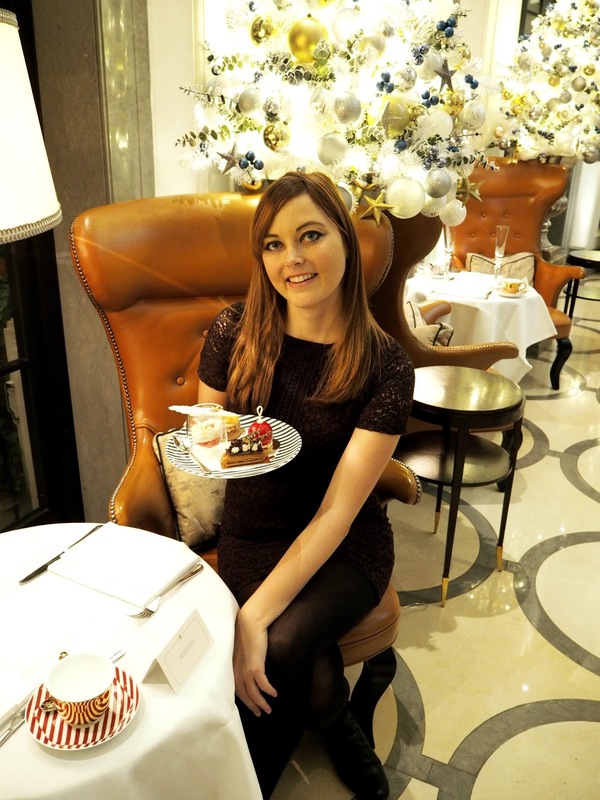 It’s been an extraordinary afternoon at The Corinthia and with their Afternoon Tea costing around £65 (incl. champagne), the experience was simply flawless. The service has been impeccable and very attentive, seconds were served with a warm smile and even vegetarian/vegan options were no inconvenience at all. 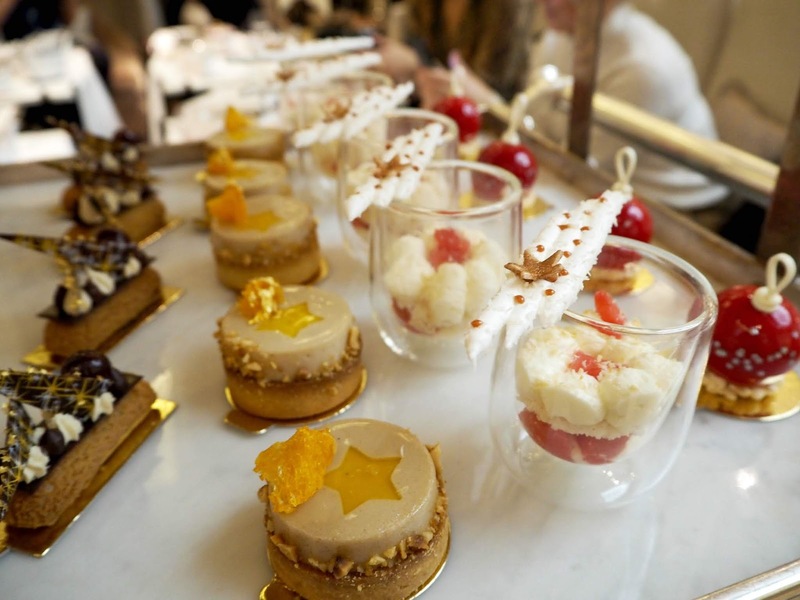 This is a wonderful addition to the Afternoon Tea scene in London which I can highly recommend.